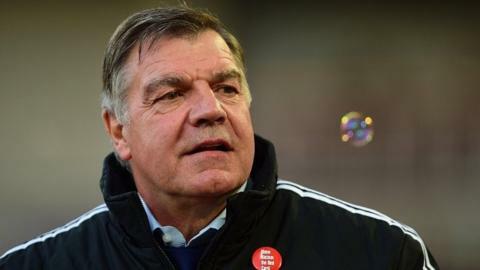 West Ham United boss Sam Allardyce says he is prepared to reassess his side's target of a top-10 Premier League finish, provided the club are still going strong at the end of January. The Hammers sit fourth having taken 27 points from 15 league games and beat Swansea 3-1 last time out. Allardyce told West Ham's website: "If we're still here towards the end of January we'll reassess our aims. "We'll have played 20 games, we'll have played everybody once. "So we should have a good indicator of where we are. "We'll see what everybody has in their locker, everybody would've seen what we have so it'll be a question of whether we can carry it on." Allardyce said the setting of a loftier target would depend on how those players due to feature in the Africa Cup of Nations coped. "I think Andy Carroll's still getting back to full fitness and he can get better once he's 100% ready. "His confidence will get better the more he plays, his goals will help too." Senegal pair Diafra Sakho and Cheikhou Kouyate, along with Cameroon midfielder Alex Song could all be missing next month. "We might have a little worrying spell during the Africa Cup of Nations in January, that's why I'm not prepared to do any more predictions until they come back," Allardyce said. Striker Andy Carroll, 25, scored two goals in the 3-1 win at home to Swansea and appears to have put his injury problems behind him. Allardyce added: "I think Andy's still getting back to full fitness and he can get better once he's 100% ready. "He's had a long layoff and only a handful of games played. "His confidence will get better the more he plays, his goals will help too. "Certainly the games he's played so far have been good and I think there's more to come."